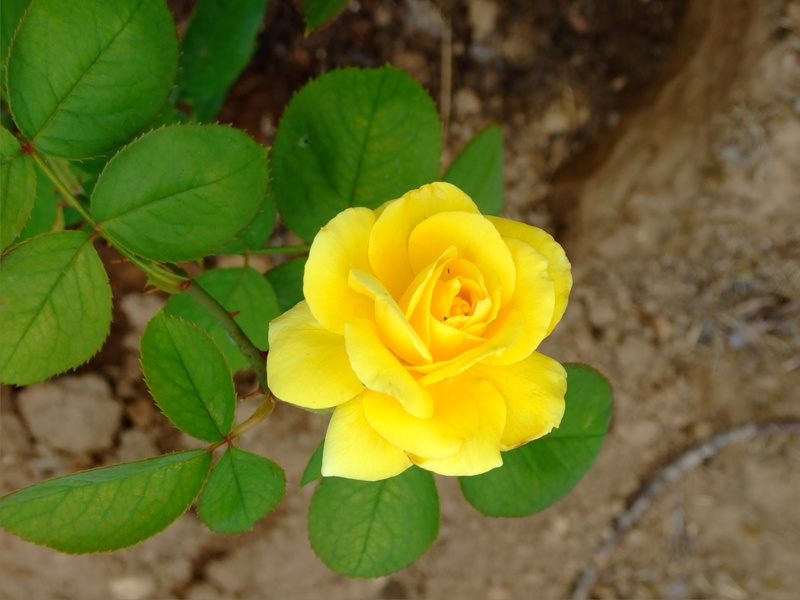 Last night I finally finished charting a picture of the yellow rose I grew in my garden last year, and thought I might share the process with you. Some of you probably already know how to do this, but for those of you who don’t, I’ll do my best to illustrate it. If you are viewing this site, I know you have a computer. And, as most computers come with software that allows you to draw simple shapes(I use Microsoft Publisher), then you have the means to make these simple charts. 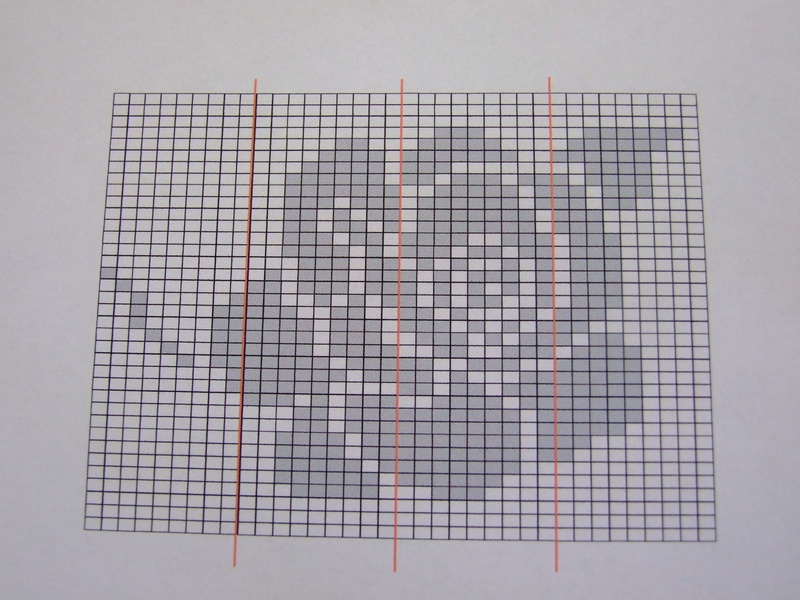 Below is a picture of a chart made for the gauge I knit when using sock yarn and a #1 needle. 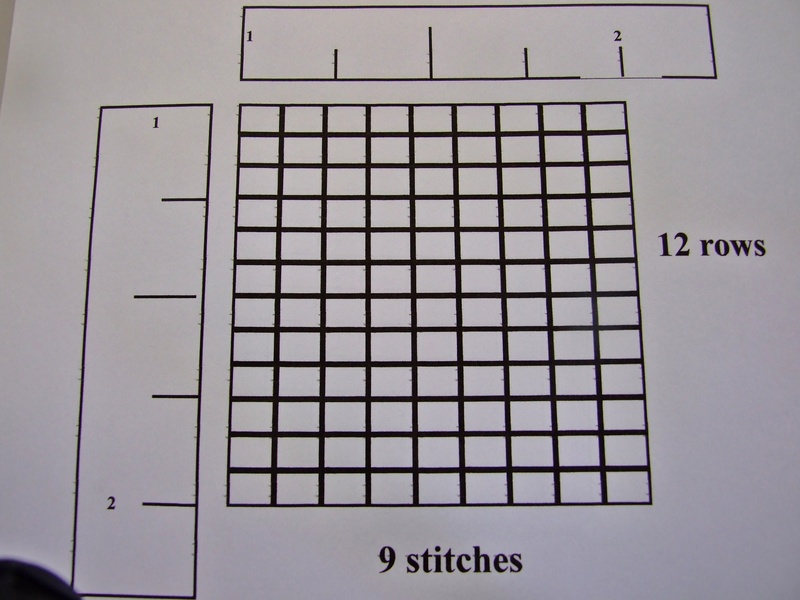 There are 9 stitches, and 12 rows, to one square inch. The chart is created by opening your art program and selecting the “square” in the shapes. Draw your square. While it is still “selected” go to the top task bar and click on the line thickness icon. Select “hairline.” Now you can copy and paste as many boxes together to represent the gauge of the project you are working on(I did 9 across and 12 down). Once you have the number of boxes neatly arranged, take the “select” tool pointer and draw a square around the entire group, then click “group.” Now line that unit up with your side and top rulers to form a one inch square. It should now look something like the picture below. The camera angle on this makes it look oblong, but, trust me, it’s square. You will also notice that your squares have turned into rectangles. SAVE this unit in a separate file, maybe something like “my 9 by 12 knitting template.” Now click on the unit and copy it. Having copied the template we will form the complete grid for our project in a NEW FILE. Paste the template as many times as needed to form the size of grid desired. When finished, group it, and SAVE IT. Why? 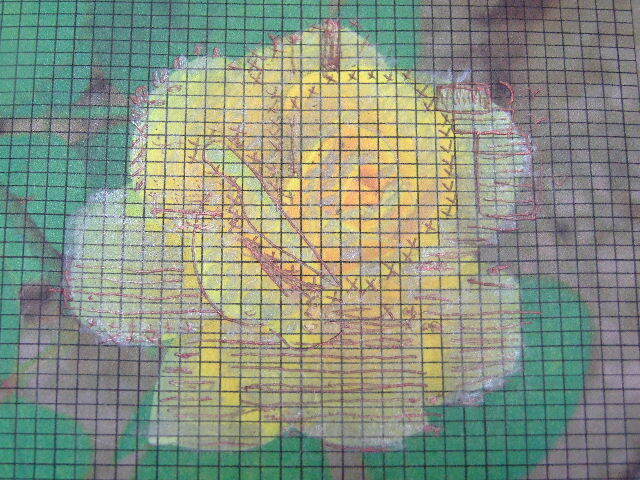 So that you will have a CLEAR grid to start again on a different picture-you won’t have to DO IT AGAIN. Ask me how I know? No, don’t. Be sure to name it, with the d1mensions-such as “my sock chart -9 by 12,” etc. Next, copy the chart that you have just SAVED. You can paste in a another file or just add a page to the file you are using. In any case, put it on a page by itself. Now you can use the “insert picture tool” to import the picture you want to chart. Enlarge it as you wish, then in the task bar at the top select “arrange.” Click on “back. ” This will place the picture behind the grid. Once that is done, you can print the page, take it to your table and start filling in the squares as you like. Here you can see some of my pencil marks. Next I will take it back to my computer, click on the squares I have marked and click the color I want to fill them in with. I chose gray. Here’s the finished product. You will notice that I also added orange lines at intervals. I do this before I start filling the color, as it helps me keep track of where I am. When I am pleased with the results, I SAVE it to my Knitting Chart Collection. PS. Another alternative is to purchase a software program called Pattern Maker Pro(PM). 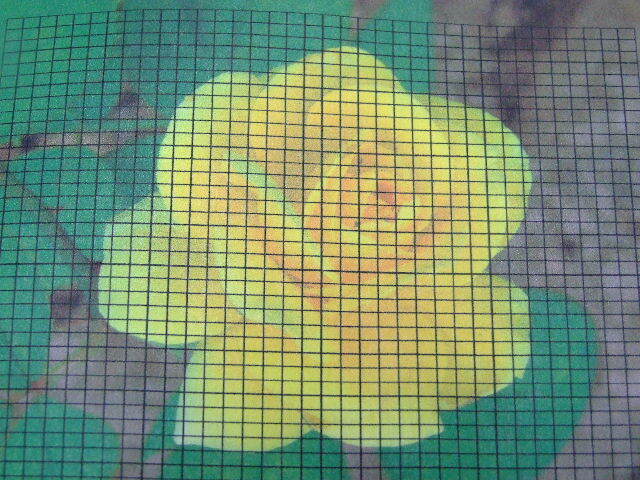 It is a cross stitch program but works well for my knitting projects. The key is to “size” the fabric with the gauge you want to use. When you set the stitch and row counts the chart grid changes to rectangles, thus what you see is what you get. Check it out. I now have PM Professional. I love it! This probably should have been one of my first posts, but, better late than never. For about 45 years I was what you would call an average knitter. I made useful things like, afgans, sweaters, scarves- you know, simple things. Then one day I picked a Vogue Knitting magazine, and in it was a picture of the lady wearing a knitted lace sweater. I had to have it. I went to the local variety store and came home with Knit Crocheen. It wasn’t long before I was witnessing magic taking place right before my eyes. This first project in lace, definitely tweaked my sense of creativity. I loved learning the new stitches, and had great fun with all the needle gymnastics involved in the pattern. Knitting wasn’t boring anymore. From there I moved on to a little more challenging pattern. 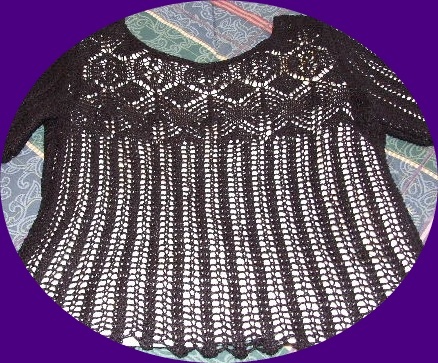 This one featured a spider web pattern on the front. It didn’t have sleeves, but this old lady does not feel comfortable without them. So.. I made some. I wear it quite often, changing the color of the tank I wear under it to go with the rest of my attire. Now I was really on fire to to something intricate. 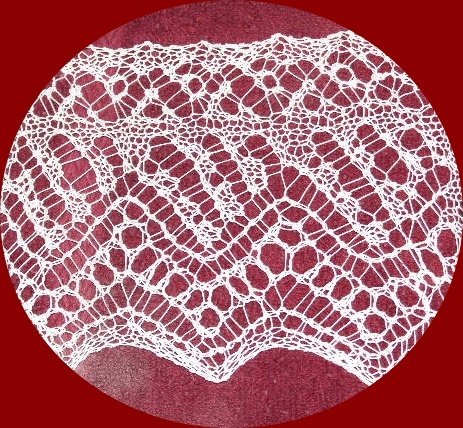 so I began my first “real” lace shawl with “real lace” yarn. 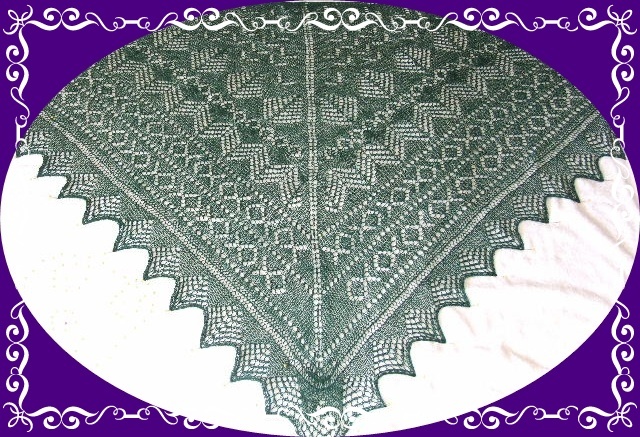 The Print o Wave shawl I made for my daughter, was offered aa a free pattern on the web, by Yuny Jang, of Interweave. I designed the header of my website with it. Following that, I ventured out to make two more shawls, one for a friend, and one for my daughter-in-law. They were followed by a lace scarf for my sister-in -law. 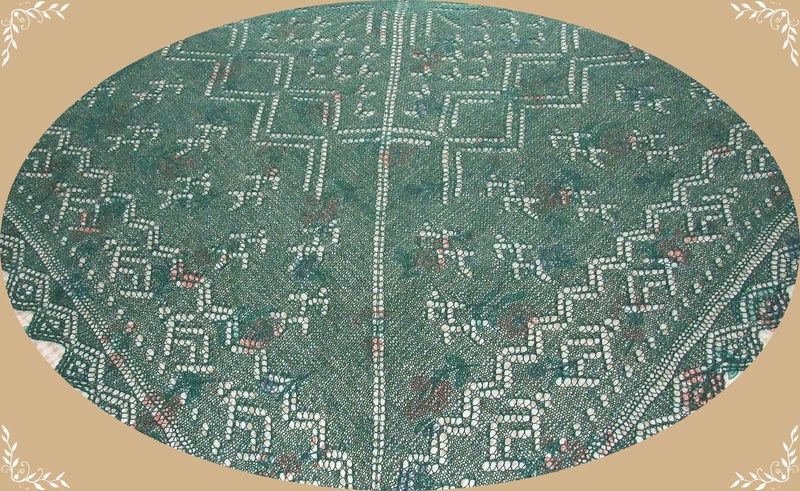 Here is the edging I am still working on. It’s my travel project. 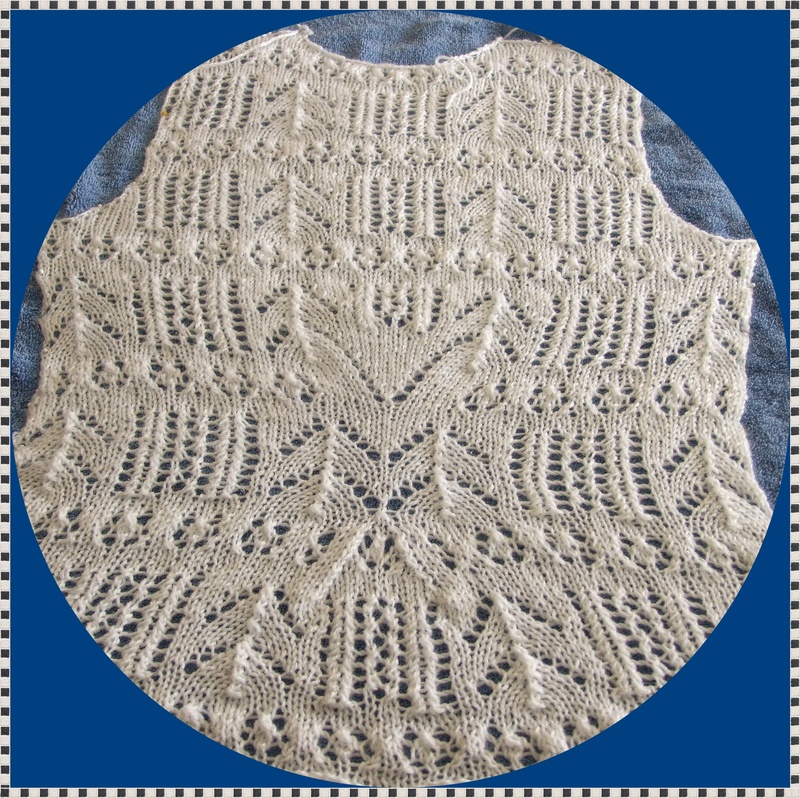 All this is to say, that new adventures in knitting have taught me to be patient, to be willing to take out and redo, practice stitches and new techniques until I get them down smoothly, and most of all, not to be in a hurry to finish. I have learned to enjoy the process. I hope you have, too. I don’t know about you, but I have had a ball this past year clicking on all the wonderful knitting websites. 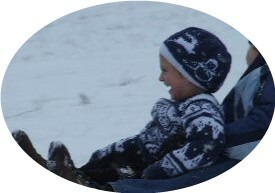 I have downloaded great patterns, and lots of tips, tricks, and just plain great ideas. I love trying them all out, and making samples to keep in my knitting binder. Now, I’m sure there are many of you who know how to do this already, but humor me, I just love writing up tutorials. It keeps me out of trouble. 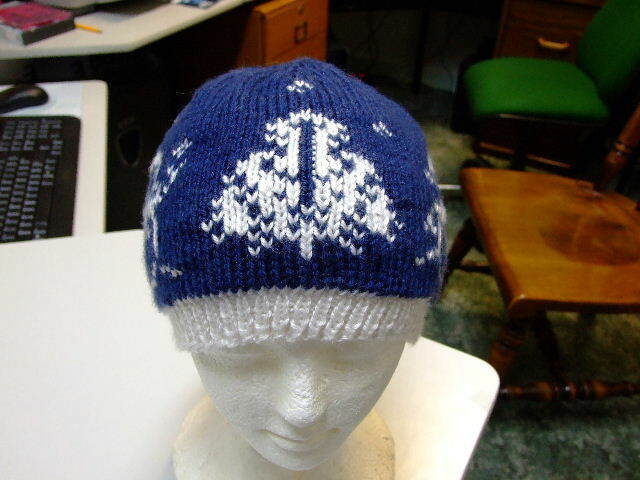 So today, I am offering you one I just finished on short rows heels. First off, let me show you the result of my experiment. 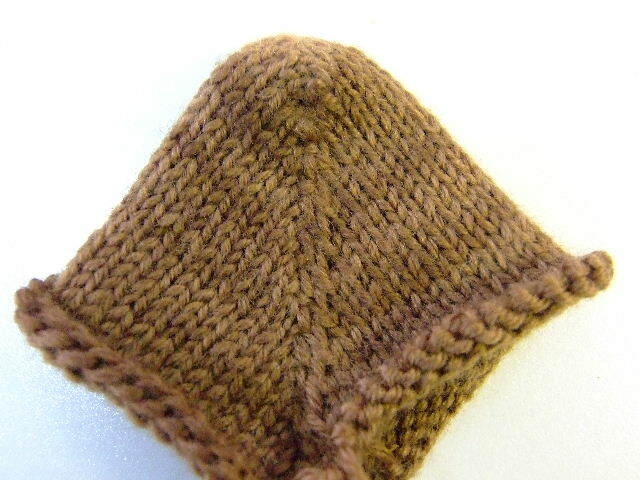 This heel sample turned out to be the smoothest short row heel of my collection. Yes, I make them up for fun. I’ve tried every wrapped one, and now I’m into the unwrapped. But so far, for me, this one works great. But one never knows, there may be another lurking just a click away. Here it is! Give it a try! As the smell of fresh garlic and onion bread wafted through the house today, I sat knitting on a pair of socks, and watched the snowflakes fall from the winter sky. Wow, I thought, it can’t get any better than this. Then it occurred to me as I removed the bread loaves from the oven, that you might be interested in my infamous Garlic Onion Bread recipe. 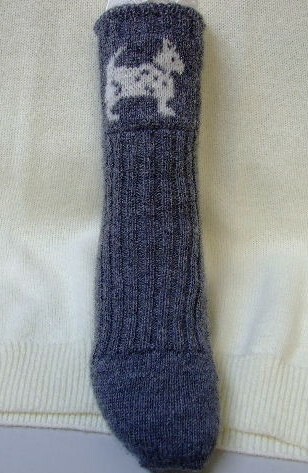 So I decide to share it before I made my next couple of knitting posts which will be on short row heels and toes. Believe me when I tell you that this is my “secret” weapon in our household. My husband would do anything for me, just to have this bread on hand. I developed this recipe after years of baking, and just plain “dinkin'” around with all kinds of breads. The one advantage of this particular bread is that it retains it’s moisture longer than most. Of course, it doesn’t last very long with someone slicing on it every chance he gets. Anyway, I thought you might like to try it. Here goes! This recipe make 2 large loaves. Day one– or 24 hours before you want to make it, in large bowl, mix together 2 cups of white bread flour, 2 tablespoons of dry yeast, and 2 cups of warm water. Cover and let sit at room tempt over night. * I usually give it the full 24 hrs. You will use all of this “sponge” for your bread. Day two – Finely chop 1 cup of onion, and place in colander to drain. Mean while, measure 2 tablespoons of olive oil, 1/2 cup chopped garlic( I get mine at Costco) 1/4 cup vinegar(either kind) and place them into a small sauce pan. Add drained onion, and heat ingredients to simmer, stirring as needed. Remove from heat, and set aside to cool slightly . While this mixture is cooling, pour the soured bread mixture (sponge) into the large bowl of your mixer. Get out your dough hooks. Next, mix 6 cups of flour with one tablespoon of sea salt, and stir together to blend. Once the onion garlic mixture is cool enough to touch, turn your mixer on medium speed and start adding the onion/garlic mixture in a spoonful at a time. Let it mix for about one minute. Now turn your mixer on slow, and start adding in the *remaining flour. Mix until your dough cleans the sides of the bowl. Remove dough from mixer. If it is a bit sticky, use some bench flour to knead in just enough for it to leave your hands. Now, grease the surface, cover it up and place it in a warm place to double in size. Next, punch it down and divide in half. Knead each half lightly and place on greased cookie sheet, or divided French bread pan. Turn on oven to 400 degrees. Cover bread and set on top of stove to rise (I do this because the oven vent seems to work great for this purpose). 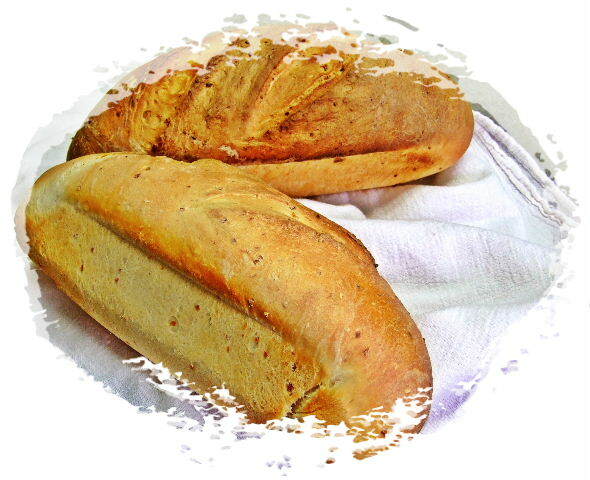 When the bread is ready to bake, spray the surface of the bread with plain water. Bake it for 10 min. Spray it again. Bake 10 min. Spray it again. Let it bake 10 more minutes (30 minutes total). Remove and cool on rack. Enjoy! * I recommend that you add all but one cup of the flour mixture in. Why? Because onions, evened drained, have varying degrees of moisture. So if they are bit dry, you might not need all the remainder of the flour mixture to get it to the point of leaving the sides of the bowl. Also, if you do not have a Kitchen Aid like I have it is easier to knead in some extra by hand. My adventure into the world of Double/Reversible knitting began last year when I happened upon a website called the Knitters Book Shelf. While perusing around the site, I spied a book called “Double Knitting, Reversible Design, by M’Lou Baber. I had to have it. The rest is history. The creative juices were indeed flowing. 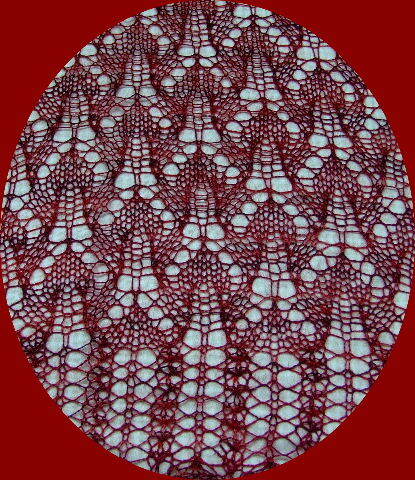 She had convinced me that I could turn any picture into a double-knit design. So, as Christmas was approaching I knew I had to make my granddaughter a ski hat to match the sweater I had already knitted her. Using the leftovers from her sweater, I play around with the gauge a bit, trying different needles. 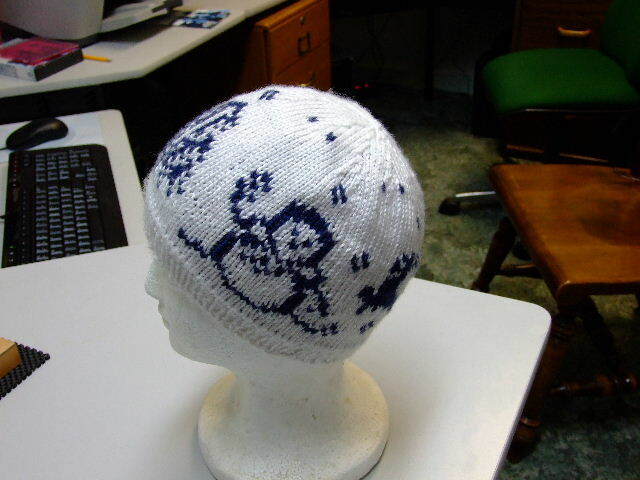 Once I had decided on that, I made my graph paper to match the gauge, then drew the pictures I wanted to go around the main portion of the hat. You can’t see all the figures, but there is a Christmas tree, two reindeer, and a Mr. and Mrs. Snowman. I learned a lot from this little experiment, and will cover some of the techniques in a future post. I even came up with one of my own. 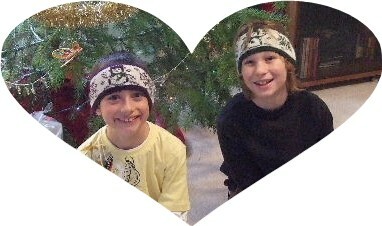 Here are my two grandsons sporting their new Christmas Head Bands. To take this one step further, I decided the other day to incorporate the idea of a double knit design in a sock that I was making for a friend. She loves dogs, so I was going to make sure that she had one. This toe-up sock pattern is for right/ left foot. I find that this approach to sock design addresses the issue of allowing more room for the big toe,(less holes) and accommodates people with unique foot shapes and deformities. My friend was thrilled with her sock. Life can’t get better than when you make someone happy.